At the 1984 Summer Olympics in Los Angeles, Mary Lou Retton won a gold medal in the individual all-around competition, as well as two silver medals and two bronze medals. Her performance made her one of the most popular athletes in the United States. Retton was the first ever American woman to win the all-around gold medal at the Olympics and was the only one to do so for twenty years. She is credited with being a pioneering figure in American women's gymnastics. 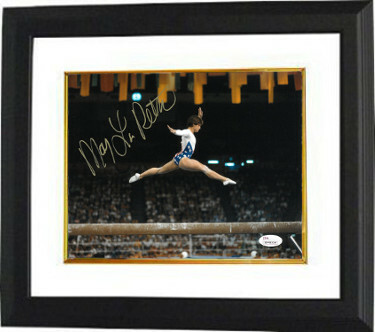 Mary Lou Retton has hand signed this Team USA Olympics 8x10 Photo from the 1984 Olympics. JSA Witnessed (In the Presence) Hologram and Certificate of Authenticity. Custom White Mat and Premium Black Frame as shown.